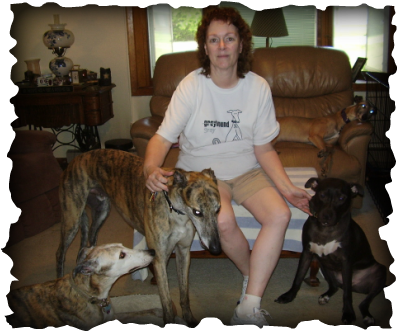 Brindle boy Teague is very happy with PJ and assorted housemates in their home in Beavercreek. PJ was Teague's foster mom and she made a special connection with him - lots of us have been there. Sometimes you just need to add them to the family. Not everyone made it into the family photo. Teague joins mixed breed Allison (his most favorite new friend), white-faced Lace, and Walker (draped on the couch), plus Sugar and Hal (who is thrilled to have another boy in the house), and BIG kitties Oreo and Mocha.